The Lilac-crowned Amazon (Amazona finschi Sclater, 1864), in German Blaukappenamazone, in Italian, Amazzone capolilla, in French, Amazone à couronne lilas, in Spanish, Amazona guayabera, is a parrot belonging to the order of the Psittaciforms (Psittaciformes), family of the Psittacids (Psittacidae) genus Amazon (Amazona), present in the Neo-tropical bio-geographic area. The close morphological proximity to the Red-lored Amazon (Amazona autumnalis), has led the taxonomical biologists to classify both species as a super-species. In the specific of the Amazona finschi, the International Commission for Zoological Nomenclature (ICZN), proposes its subdivision into two subspecies, the Amazona finschi finschi and the Amazona finschi woodi Moore, 1937; the last one in German is called Sonora Blaukappen-amazone, for the other languages the common denomination is the same, whilst the subspecies Amazona finschi finschi has the same common denominations of the nominal species. This species of parrot, along with the relevant subspecies, is not very common, but in some geographic areas, due to the continuous processes of deforestation which involve also its biotopes and due to the poaching, which renders them object of the desires of the traders of ornamental birds. To these phenomena we have to add the pitiless hunting of the countrymen, who deem them as dangerous to the agriculture. They are inserted into the Appendix I of the Washington Convention, 1975 -Convention CITES), by which their trade, for commercial purposes, is strictly forbidden. The IUCN has placed them into the red list of the endangered species. Both the nominal species Amazona finschi, and the subspecies Amazona finschi finschi, are autochthonous to the central-western and south-western parts of Mexico; from the state of Sinaloa up to south of the federal state of Durnago and up to Oaxaca, the southern-most Mexican state, located in the south-western part of the isthmus of Tehuantepec. 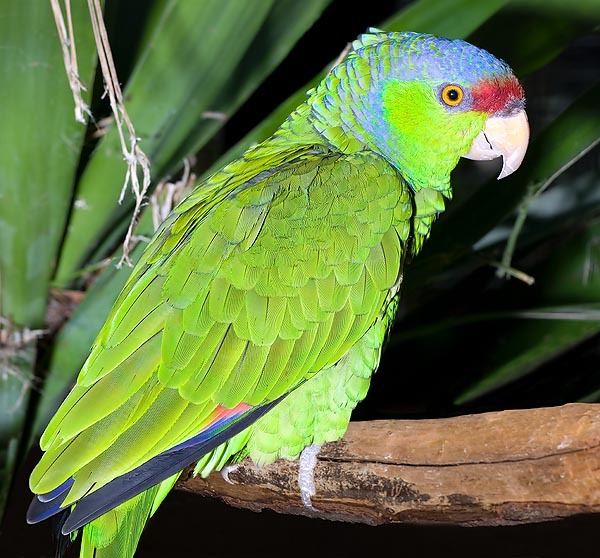 On the contrary, the subspecies Amazona finschi woodi is autochthonous to the north-western Mexico with a geographic distribution spreading from the central-eastern part of the states of Sinaloa and Durango up to north-west of Sonora and south-west of Chihuahua. The nominal species as well as the two subspecies tend, in the geographic areas where localized, to colonize the forests of the lowlands and the mountain forests, up to the altitude of 2.200 m above the sea level, where they electively carry on an arboreal life. In both biotopes, they prefer the oak and pine forests. Occasionally, they may be sighted in the coastal mangroves. They have a marked tendency to forage in the cultivated fields, possibly in those cultivated with cereals and maize, and the plantations of banana trees, surely causing serious damages to the local agriculture. For the rest, their alimentary ecology is based on fruits (especially wild figs, of which they are greedy), seeds, soft fruits, nuts, buds of growing leaves and flowers. Green is the dominant colour in the Amazona finschi with vast greenish yellow areas on the thorax and the abdomen. The fore of the head, the front and the upper part of the nape, have a dark red colour. The nape and part of the neck are blue, the periophthalmic area, the cheeks and the feathers which cover the ears, are greenish-yellow. Te secondary coverts are violet-blue, the speculum is red, and involves also the five primary remiges. The tail is green, with greenish-yellow tips; at the base of the tail there is a blue texture. The skin close to the periophthalmic ring is grey, the pupil is yellowish, the iris orange and, finally, the zygodactylous feet are grey. Males and females do not have phenotypic characters of sexual dimorphism either seasonal-transitory or permanent; the immature specimens have a more eclipsed plumage and a dark iris. Both males and females measure about 33 cm, weigh, as an average, 300 g, and have a wingspan of 10,5-20,8 cm. 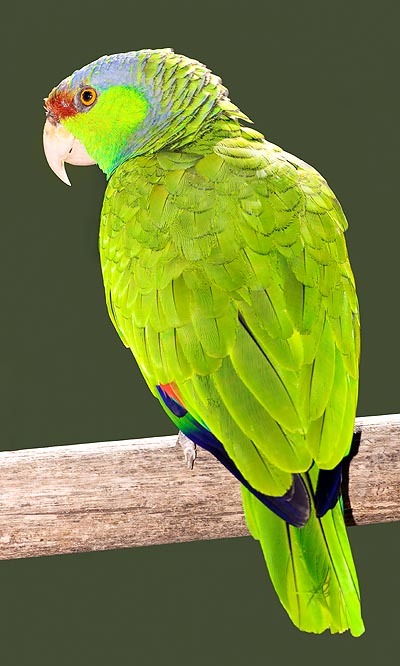 The subspecies Amazona finschi finschi, has a similar livery, and also the size, whilst in the Amazona finschi woodi the yellow component of the plumage, mixed with the green one, is smaller. The dark red dot in the fore part of the head is narrower and duller as intensity. The parrots of this subspecies are a little wider and 34 cm long. The wingspan goes from 19,3 to 21,5 cm with an average weight of 350-370 g. Also in this case, the sexual dimorphism is absolutely absent. They leave in pair or in unstable groups of about 300 individuals. Several hundreds of these amazons may share a common resting area. They are rather noisy. Especially when flying, they emit hoarse cries, and are characterized by seasonal migrations. The reproductive season, in the wild as well as in captivity, goes from February to June. During such time, the male builds up the nest inside the hollows dug by woodpeckers in the trunks of standing fig trees, in the thick forest at high altitudes, even at also 2.000 m above the sea level. The female (but these data are still to be ascertained), is likely to lay 2-4 eggs of 3,7 x 2,9 cm of size. The hatching lasts, as an average, 26-27 days. The pullets should be then fed for about eight weeks, before flying away.